Back when I was married and would occasionally come home with some new and exciting clothing purchase, my ex-husband would exclaim, in an invariably exasperated tone, “But did you really need that?” And each time I would explain to him that it’s not a question of need. The heart wants what it wants, and right now mine wants some new jeans, post-haste. 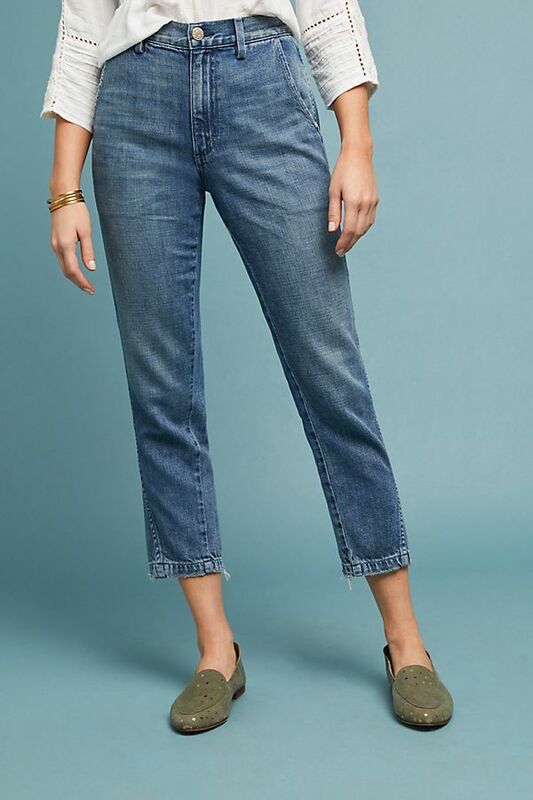 I’m thinking mostly (but not exclusively) about pairs that have something interesting going on, like these carpenter jeans, which remind me acutely of seventh grade. 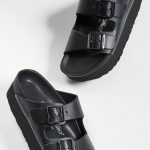 I’d wear this Madewell pair with an otherwise very streamlined outfit. I just think the wash on these is pretty perfect. I’m intrigued by the notion of an exposed button fly, which feels kind of fun and retroish. Here is an also quite cute and cheaper pair. I will never look good in coveralls, but I will never stop wishing I did, and these are pretty great. Does anyone else find the notion of flared jeans intriguing? OK, these leopard print jeans are rather nuts and also from R13 so they’re pricey, but I kind of think they’re fantastic too. I don’t usually like white exposed stitching, but on this chino-cut pair, it’s rather spiff. This pair is such a nice dark wash, and is so blessedly free of whiskering and other distressing that you could get away with wearing it to the office. 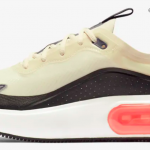 Here is a cheaper pair that’s also quite good. 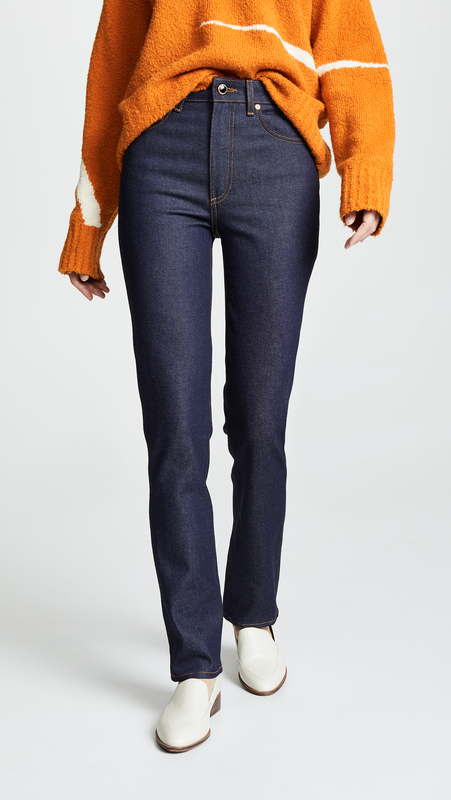 I think these trouser jeans would be quite flattering on those of us with hips. A tuxedo stripe dresses these up a bit. And finally: I dig the very subtle camo print here. I don’t like and won’t wear cropped anything! Jeans or T-shirts. I also think it will be a cold day in hell when I wear flares or straight leg jeans or pants again. Long live skinnies! Definitely not a cropped T-shirt. I’m with you on the skinny – by far the most flattering for me. I can’t seem to give up denim in the summer so desperately looking for alternatives to the skinny! Our summers are painfully humid. Definitely not a cropped T-shirt. I'm with you on the skinny - by far the most flattering for me. I can't seem to give up denim in the summer so desperately looking for alternatives to the skinny! Our summers are painfully humid. I guess I’m in the minority. 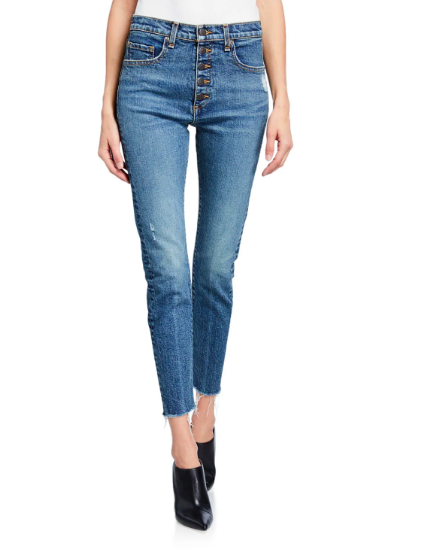 I liked a cropped jean, probably because I’m only 5’5″ so it’s nice not to have to hem. Also saves me the trouble of having to roll them “just so” so I can wear ankle boots. And I keep reading it’s more flattering to expose the ankle? I guess I'm in the minority. I liked a cropped jean, probably because I'm only 5'5" so it's nice not to have to hem. Also saves me the trouble of having to roll them "just so" so I can wear ankle boots. And I keep reading it's more flattering to expose the ankle? I finally understand the concept of a “trigger warning”—at the sight of those carpenter jeans I time-traveled back to the very worst days of 7th grade! 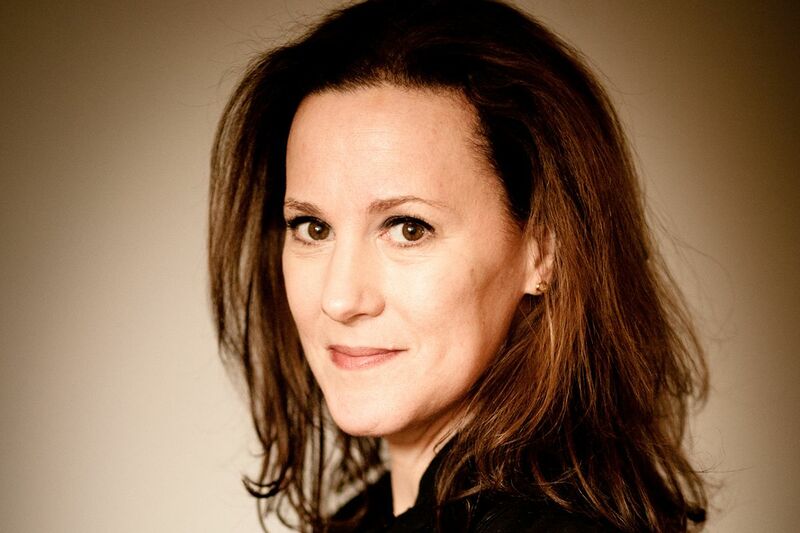 Fortunately, the gorgeous jeans in the 3rd photo helped me get out of the fetal position…. those are like the Platonic ideal of jeans. I finally understand the concept of a “trigger warning”—at the sight of those carpenter jeans I time-traveled back to the very worst days of 7th grade! Fortunately, the gorgeous jeans in the 3rd photo helped me get out of the fetal position.... those are like the Platonic ideal of jeans. My favorite jeans are some cheetah print ones I got from Blank NYC. They’re comfy, have good stretch, and a high enough waist to still be flattering. 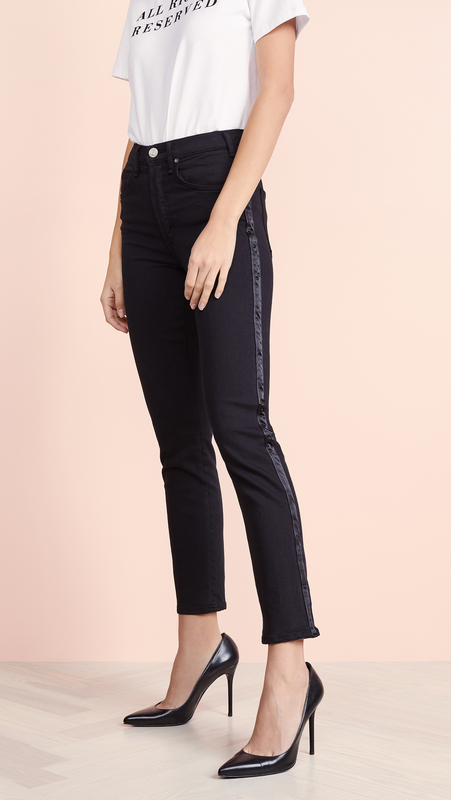 I also just ordered some straight-legged black jeans from Madewell. Hopefully they will be flattering,as I’m trying to get away from the skinny jean look, but am too short to pull off flares. My favorite jeans are some cheetah print ones I got from Blank NYC. They’re comfy, have good stretch, and a high enough waist to still be flattering. 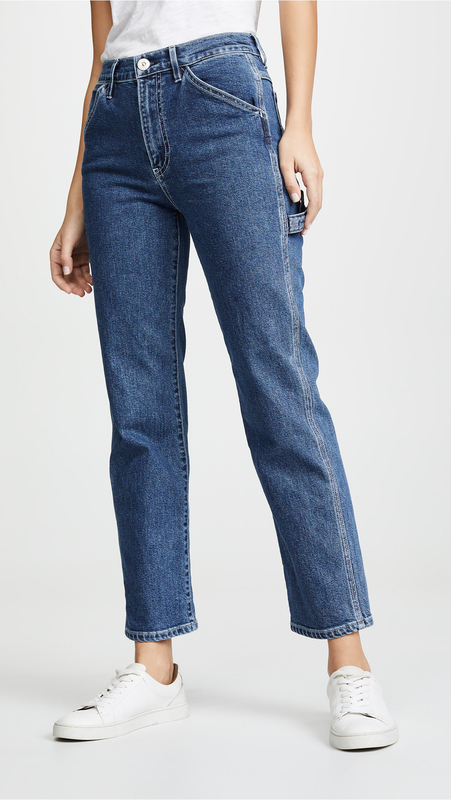 I also just ordered some straight-legged black jeans from Madewell. Hopefully they will be flattering,as I’m trying to get away from the skinny jean look, but am too short to pull off flares. Those Madewell ones with the dark blue stripe running down the side are calling my name – I need to give my skinnies a rest. These ones have slight distressing at the knee which I’m happy to see are still fine for those of us at a certain age! 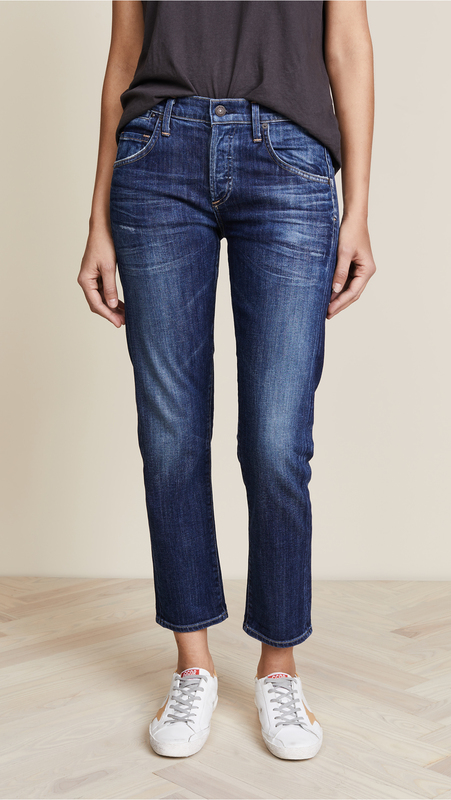 Those Madewell ones with the dark blue stripe running down the side are calling my name - I need to give my skinnies a rest. These ones have slight distressing at the knee which I’m happy to see are still fine for those of us at a certain age! Black flares are aces, as are the kooky yellow leopard, just wish they were longer. I agree with Viajera, we need more full length options soon! I like a cropped pant/jean here and there, but not every pair all the time. Sometimes they just don’t look right, maybe even a bit dumpy. And a crop pant with a super high waist just looks off to me. Those long black flares jumped off the screen. So flattering. They look chic and fresh as hell. Really want a pair of jeans that 1) at least hit my ankles 2)are really denim and not spandex 3) don’t hug my calves. Remember straight legs? I definitely love the look of flares and have purchased them in the past. Having said this, I never reached for them. They generally require a tucked in shirt and I’m hesitant to do this. I also struggled with finding the right shoes. I definitely love the look of flares and have purchased them in the past. Having said this, I never reached for them. They generally require a tucked in shirt and I’m hesitant to do this. I also struggled with finding the right shoes. Agree about the finding the right shoes part. As someone who is 6′ tall, I feel like heels look good with flares but I am unwilling to wear them. Any other good suggestions for what shoes to wear with flared pants in a professional setting? Agree about the finding the right shoes part. As someone who is 6' tall, I feel like heels look good with flares but I am unwilling to wear them. Any other good suggestions for what shoes to wear with flared pants in a professional setting? Pointy-toe flats! I never wear heels anymore, but I love a bootcut or a good flare and I’m 5’10”. I’d say clogs, too, but not as work wear. I will stick to my Everlane jeans you recommended and save $300+ for something like shoes! When did I get so old that it is an awful lot to spend on "dungarees?" 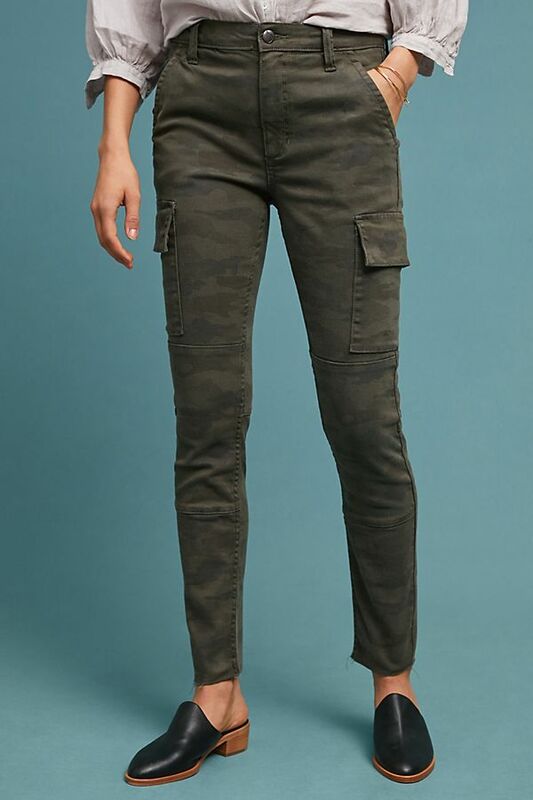 I totally love my Citizens of Humanity Emerson jeans- I have them in several washes and they are just the perfect boyfriend jean. But maybe not THAT wash……hmmmmmm….. I have yet to see anyone in coveralls who looked so good that I noticed it. Well maybe Evil Knievel. I think it must have to do with the tailoring. What intrigues me is the prospect of finding full length pants that are not men’s pants. Maybe this will be the year! Well, sorry to be so cranky. I am just not in step. It was fun looking though. I have yet to see anyone in coveralls who looked so good that I noticed it. Well maybe Evil Knievel. I think it must have to do with the tailoring. What intrigues me is the prospect of finding full length pants that are not men’s pants. Maybe this will be the year! And, no offense but ... what might lead you to believe that a high waist light wash trouser jean - tucked in, no less - will flatter anyone? Much less the hippie amongst us? If it looks bad on the model... Well, sorry to be so cranky. I am just not in step. It was fun looking though. You’ll note – they are “tall.” At a leggy 5’5″ I am NOT tall but these are the perfect length on me- the way pants always used to fit. No cold sliver of skin at the ankle. No awkward length that only works with specific shoes. So that’s my new trick. I will order only tall jeans until the pendulum swings back. 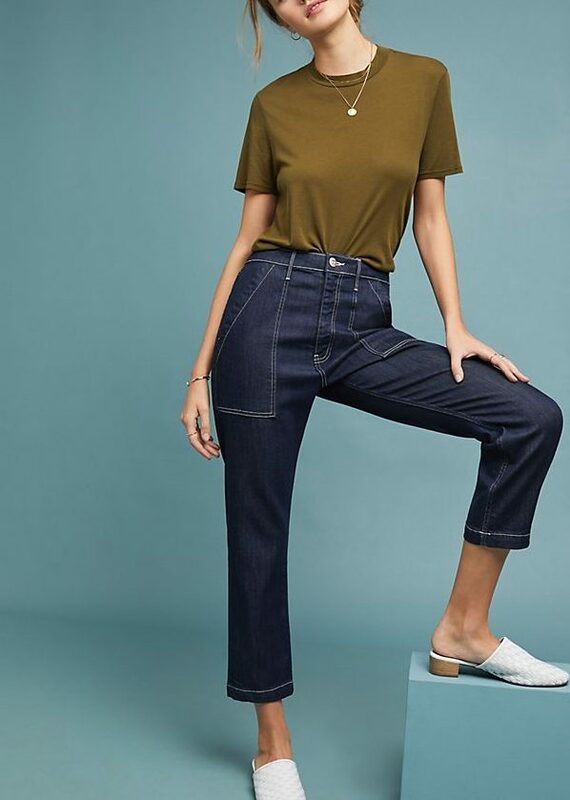 I just ordered these Madewell jeans: https://www.madewell.com/the-tall-slim-boyjean-in-hayes-wash-99105127104.html You'll note - they are "tall." At a leggy 5'5" I am NOT tall but these are the perfect length on me- the way pants always used to fit. No cold sliver of skin at the ankle. No awkward length that only works with specific shoes. So that's my new trick. I will order only tall jeans until the pendulum swings back. I love you Viajera! Never change. You are much too kind. My little brain gets a tiny bit more open from hanging around here. Some day I am going to break out and wear drop crotch! And if I do, you-all will be first to hear! You had me at Evil Knievel, Viajera. So nice!! I imagegoogled him after … now I’m wondering if he wore separates. Looked amazing though. So nice!! I imagegoogled him after ... now I’m wondering if he wore separates. Looked amazing though. I don’t think I understand what having “hips” means. More pear shaped? Because I have hips, but I’m more of an inverted triangle/hourglass and I never really worry about looking “hippy” or trousers not fitting. My waist (everything too big!) and bust (everything too small!) are my problem areas. I don't think I understand what having "hips" means. More pear shaped? Because I have hips, but I'm more of an inverted triangle/hourglass and I never really worry about looking "hippy" or trousers not fitting. My waist (everything too big!) and bust (everything too small!) are my problem areas. I’ve seen coveralls pulled off! I've seen coveralls pulled off! Yes! 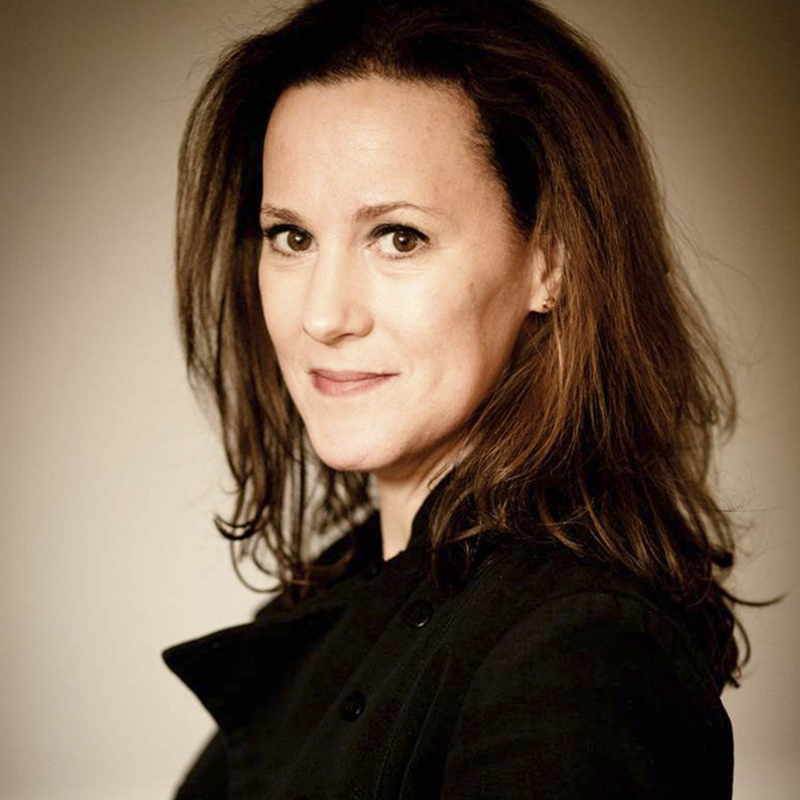 Check out the Instagram acct of The Streicher Sisters – a Hollywood based sister trio that does the hair, makeup and brows of the rich & famous. They pal around with Mandy Moore and there’s a pic of all of them wearing coveralls…adorable! Yes! Check out the Instagram acct of The Streicher Sisters - a Hollywood based sister trio that does the hair, makeup and brows of the rich & famous. They pal around with Mandy Moore and there’s a pic of all of them wearing coveralls...adorable! I want ALL these jeans! I just ordered non-denim coveralls. I’ll keep you posted IF I can pull them off. I want ALL these jeans! 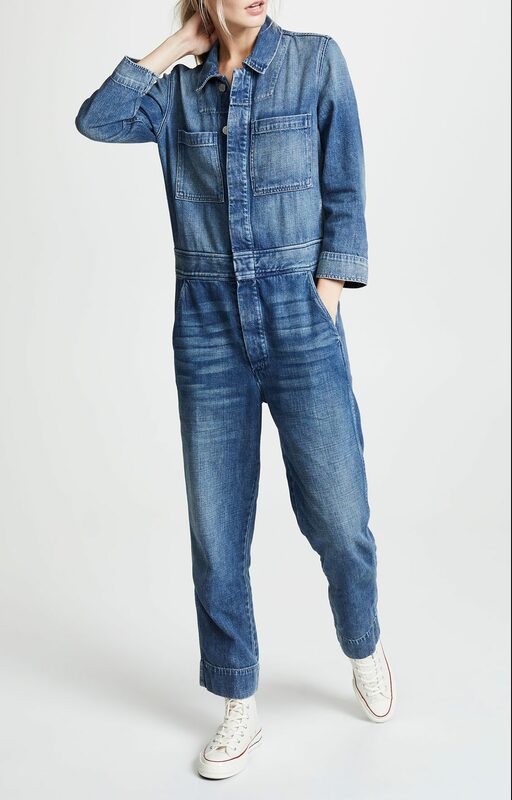 I just ordered non-denim coveralls. I'll keep you posted IF I can pull them off. I like so many of these! I also remember wearing carpenter jeans, what a flashback. When I find a pair of jeans that fit that I like I buy ’em because companies are ALWAYS discontinuing things I love. Pretty sure it’s a conspiracy. As a result I have a closet full of jeans which means I am well prepared a dystopian future when all manufacturing will cease. Yet, I do feel there are a couple of pairs here that would make my preparers for the dystopian future closet more complete….